The curse of Tutankhamun's tomb was 1920s' fake news, according to John J Johnston, vice-chairman of the Egypt Exploration Society. 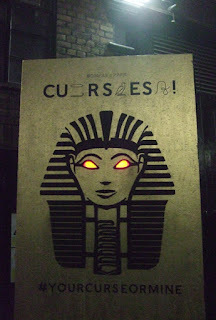 In a talk at the Curses Night Special at the Petrie Museum on Friday, he explained that the idea was made up by newspapers that had been denied access to the dig. Tales of a mummy's curse were guaranteed to sell papers, even if the stories were untrue. That isn't to say cursed Ancient Egyptian tombs don't exist - there are many examples, although academics prefer to call the warnings "threat formulae" - and they were originally designed to deter tomb raiders. Sort of "Trespassers will be cursed" signs. The idea ran and ran, with the death of anyone vaguely associated with Tutankhamun's legacy being blamed on it. Mr Johnston said he still gets people coming up to him who bought tourist items at the 1972 British Museum Tutankhamun exhibition, concerned that their postcards or plastic trinkets might be bringing them bad luck. However, the Ancient Egyptians were certainly not averse to cursing - the installation currently on at the Petrie is all about that. With an audio guide, you are led around the museum on a trail of curse tablets, papyri, death masks and numerous other items associated with using magic to deter or defeat enemies. The picture at the bottom shows dolls and footcases. The footcases were decorated with pictures of one's rivals, with the idea that as you walked you stamped them into the ground. The dolls in the collection are actually just children's toys that look creepy because they are so old, but effigy magic was very popular in the ancient world. Many pottery curse dolls have been found with limbs broken off. The idea is that whatever you do to a doll made in a likeness of a person, you do to the person themselves by sympathetic magic. Last but not least in the exhibition is the item in the case you can see photographed to the left. It is a specially commissioned cursed item made by a modern shaman. 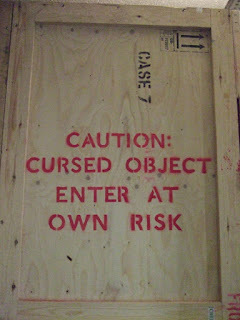 As it says on the box, enter at your own risk. Hmm, yes, it seems you are right. It was free when John and I went round. Thanks for pointing that out - I have now changed the price details on my blog.